Near the bottom of this page - there is a form you can fill out to share your doll interests with others, along with pictures. Support for our men and women during World War II extended into the manufacture of dolls and toys during the war years 1941-1945. Even Madame Alexander produced a 14" W.A.V.E. and W.A.A.C. 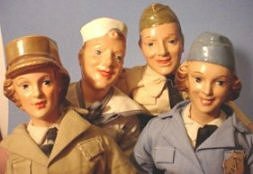 eBay has a rather large set of listings of vintage World War II Military dolls for sale, if you are interested in a purchase, or to find values if looking for costs, it is necessary to register with eBay. "Praise the Lord and Pass the Ammunition!". An original World War II Military Doll will bear a tag with this quote. All composition with molded hats or caps, these proud representatives are circa 1942. They are approximately 15" tall. 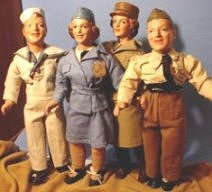 My favorite military dolls were created by the Freundlich Novelty Co. The adult likeness captured and preserved our nations young men and women in the Armed Forces to be enjoyed by many future generations. 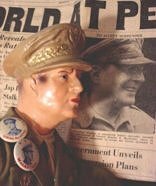 A collection of World War II Military Dolls would not be complete without one of the great generals of WWII--Douglas MacArthur! Freundlich created a portrait of probably the most famous military figure of the war, General Douglas MacArthur. Appropriately taller than his military counterparts, he is 18" and was produced circa 1942. 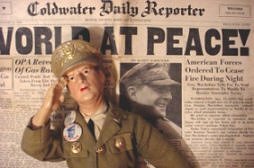 A figure that is closely connected with related historical items, some MacArthur memorabilia surrounding him creates a most interesting display. The General is all composition with a molded hat. His arm is bent so that he can salute adequately. The doll also had a tag which stated "General MacArthur-- The Man of the Hour." Newspapers such as the original shown with the doll are available on ebay. Over the years several small pins bearing General MacArthurs likeness have been added to his uniform. The last photo shows the strong resemblance captured by Freundlich. The newspaper proclaims what we should never forget. One of my most shocking experiences was with a 17-year-old from this generation, who did not know who General MacArthur was...or when or why World War II was fought! There is much information and memorabilia about General Douglas MacArthur, books, pins, postcards, campaign buttons, first-day covers, photos, and even some games. Welcome to "Show and Tell" for early Manufactured WWII Military Dolls and Toys! We all love to share. If you have photos and information on these lovely very early WWII Military Supported Dolls and Toys, please fill in the form below to "Show and Tell" your favorite Vintage Military Dolls and Toys. We all have an interest in how they were located, the use of materials in their clothing and anything else you would like to share with other avid collectors.